Here in the Scott household, yours truly has taken a bit of ribbing from Frau Scott for saying bonne things (scroll below) about Cate Le Bon : Hows your new girl -friend! has been the taunt. Well, shes got it all wrongits not like my admiration for Susanna Hoffs or Zooey Deschanel . . . since I cant say that Cate is that visually attractive to . . . oh, but Id better quit on this while Im ahead. So, I need a post right quick that exudes musical masculinity, and what better way than to celebrate the great Dave Gonzalez! Long lauded by Guitar Player and those on the blues circuit, back in my San Diego hometown every even mildly hip person knows he was the main man in The Paladins, the rockabilly-blues trio that never failed to bring down the house. Discerning country music fans have begun to get up to speed with Dave, given his work with the Hacienda Brothers, and more recently, the Stone River Boys. I believe Dave currently lives in either Texas, and Im not sure if the Stone River Boys are still in actionthis is a net-researched blog post and not a piece of music journalismalthough there is a recent you-tube of him playing with a group called the Fernandez Brothers —mighty killer-soundin rock n roll. Whether its a new project or a one-off, those of you new to Dave might as well start there. The key is the purism. I remember on one of his guitar cases he had a sticker that said Older is Better , and his various bands have always proceeded in that retro rock n roll spirit, discussed in the Songbook here , in which vintage instruments and recording techniques were prized. 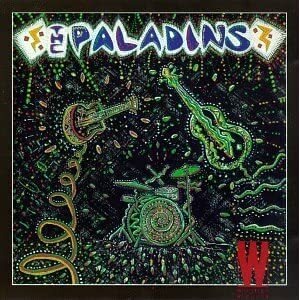 Indeed, the first Paladins album, produced by the genius Mark Neill in 1986, remains a monument to this spirit, and IMO remains their best recording. A taste or two ? Well get back to the Paladins, but l want to first highlight his interesting work in country. Along with Chris Gaffney, Dave formed the Hacienda Brothers in the mid-aughts, a group particularly interested in following the possibilities set out some time ago, by the likes of Dan Penn, of combining classic soul and country. Their cover of Cowboys to Girls, or their playing here with Penn , should give you an idea of how fine such an amalgam can be. The Stone River Boys often explore this in their way, albeit without the beautiful voice of Chris Gaffney , who passed away (cancer) in 2008. The Hacienda Brothers were a way for Dave to not be the center of attention, to play in a less solo-centric manner and subordinate himself to the needs of song, but of course, they had to set him (and themselves!) loose from time to time. What a true American treasure, in a distinctively Southwestern key, the Hacienda Brothers were! May others follow in their footsteps, particularly on that country-soul pathway. Dave will perhaps always be most remembered for The Paladins, THE best band of the 1980s and 1990s. While mainly known for their swinging blues , a la Stevie Ray Vaughan (but better), and rockabilly , the band was more versatile, especially studio-wise, than the killer live attack theyre famous for would suggest. “Ticket Home” , for example, sort of a gut-bucket folk rock number and fitting right into the American canon of goin home songs,” might have been their chance at top-forty hit, but it didnt happen. Greater attention was paid in Holland, whose fans shelled out the bucks to get a reunion tour goin in 2010. Heres two interesting interview segments from that tour , that give you lots of info and a sense of Daves great personalitySouthwestern folks will fondly note that wry Mexican-American lilt in his voice, and Catholics might note his crossing himself when he mentions Chris Gaffneys passing. Daves guitar work doesnt just win over the solo-fetishizers, but always also captures the dancers . The man can make anything, however, even a seemingly cliché rockabilly hot-rod number , something special indeed. This greatness is not just a matter of raw talent in the fingers. Nor is it only the (really quite cultivated , i.e., thousands of platters listened to) retro-purism that makes that talent bloom. The Paladins said a few times that the best way to get in touch with Americas music was to go tour the country; and they continually did so in their van, literally earning the title they gave one of their live albums, Million Mile Club . I exchanged a few words with Dave once on tour, and they were to my mind telling ones. At the time, I was attending the St. Johns College masters program in Santa Fe, New Mexico, and dropped down to Albuquerque to check out one of Daves shorter-lived, but very Paladins-like, bands. After a bit of heartfelt thanks and praise, I told him I knew them from San Diego, and he asked me, Whyd you move to Santa Fe? You have a new gig there? It was funny to me, because nothing in the world could be less like a gig than doing graduate work on the Great Books on my fathers dimeor even working there as a tutor as I did shortly thereafter—St. Johns was and is the pure skole experience in both senses of the Greek term: school and leisure . I didnt try to explain that to Dave. But it also struck me that this was the way he just naturally thoughthe had taken up the life and talked the talk of the hard-workin American bluesman town-to-town entertainer. Even had I not been at St. Johns, it would have seemed an out-of-tune-with-the-times way to talk, since for all he knew I had moved for a new computer programmer job. A truck driver, a bluesman, a construction worker, or a cook might well speak of having a new gig, but it seemed off for my line of work, teaching, and for most lines typical of the tech and service heavy economy, where we professionals prefer to speak of bullet-point accomplishments on our resumes than of gigs. I guess Dave had been more in touch, and the Paladins had forced themselves gig-by-gig to remain in touch, with the working-class aspects of Hard America that blues-swingin music had always thrived in. I once spoke in the Songbook, with respect to Pete Townsends frustrations and Muddy Waters observations , of the authenticity and apprenticeship problems faced by various middle-class rockers aspiring to musical greatness in the Afro-American tradition. And as I noted there, Dave is one of those who, due perhaps to his background but most of all to his dedication, overcame the hurdles. The other thing that grounds his greatness is, well, a certain up-front goodness , reflected not only in Paladins name but in his (and Tom Yearsleys) songwriting. Here Im going to speak only of Paladins songs, because Im not yet that familiar with Daves for The Hacienda Brothers. The Paladins always played lots of covers, but a good third of their set would be originals. And while some of these seemed designed to just fit into the blues-shakin party-time tradition (Honky Tonk All Night, Irene,) including a few that pointed to the bedroom(Hold On, The Thing), the band always seemed to writin and coverin songs about women who party too much (Playgirl, Daddy Yar, etc.) and songs about stayin true to your woman (Lucky Man, Happy Home, Long Way to Town). Gettin hitched and stayin so were always good things in Paladins songs, although of course there were plenty of songs about love-life troubles, too. The story is by no means over, of course. Future Paladins reunion tours may occur, and whatevers going on or not with the Stone River Boys , Dave still seems to have a passion for writing and recording. And times judgment will eventually rectify the near-criminal neglect his bands received in their heyday. Lots of folks in the rock and roll retro scenes who did deserve more recognition than they got will be forgotten, but not Dave Gonzalez. No way. UPDATE: Good news, the Stone River Boys are still at it! All the info I have at present is for a mid-October date in Cedar Falls Iowa: A club called the Hub If you’re anywhere within 3 hours, I’d strongly advise going!